It is October 26, 2016. There is so much going on. Very few news outlets are covering Native people who are taking action to protect water from Big Oil. #NoDAPL is a hashtag people are using to write and share news and support of the Standing Rock Nation in its resistance to a pipeline. Early in that pipeline's development, it was supposed to go into the ground near Bismark, but the people of Bismark said no. They didn't want the risks it posed to their water. It was subsequently moved to a location where it is near Native people. Their objections were dismissed. The outcome is a gathering of thousands of Native people from hundreds of different tribal nations, and non-Native allies who are moving there, setting up camp, and using their bodies and presence to say no to that pipeline. Did you know people who have been arrested are being strip searched? Did you know journalists are being arrested? Did you know that, early on, a security team hired by the pipeline unleashed attack dogs on people there? Amy Goodman of Democracy Now was there when that happened. Have you seen her news casts? There's a segment in one about a dog whose mouth is dripping with blood of someone it bit. Did you know that people gathered there were using drones with cameras to document what is happening there, but that the Federal Aviation Administration has now determined that area is a No Fly Zone? #StandingRockSyllabus from the NYC Stands With Standing Rock committee. Dakota Access Pipeline: Native American Perspectives from Sarah Kostelecky, Paulita Agular, and Kevin Brown of the University of New Mexico's library system. You can also get information by using the #NoDAPL hashtag on Twitter. Follow @DemocracyNow and @UnicornRiot. Be wary! Don't get duped! There are a lot of pages online where you are invited to purchase items related to #NoDAPL. Those sites say that proceeds will go to #NoDAPL but there's no evidence of that happening. I'm sending my donations directly Standing Rock. They set up a PayPal page. I'm also sending donations to the site raising funds for the Mní Wičhóni Nakíčižiŋ Owáyawa school. On their Facebook page, they tell you how to donate. I know it is tempting to send items but I believe the teachers know best what they need. Sending them funds lets them get what they need. Adding a link to a pdf of information put together by Indian Country Today. 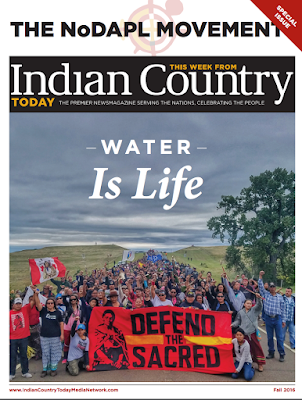 It is a special issue devoted to Native responses to the Dakota Access Pipeline. Across the country, baseball fans are watching and following news about the World Series. One of the teams uses a racist mascot. That mascot is everywhere, doing damage to those who view it. Research studies on the harm of such imagery actually used the one from Cleveland as part of the study. The outcome? Images like that have negative consequences on the self esteem, self efficacy, and "possible self" (what someone imagines they can be as an adult) of Native youth who see them. The study, Of Warrior Chiefs and Indian Princesses, is available for download on line. It was published in a psychological research journal, Basic and Applied Social Psychology. Get it. Read it. Study it. Share it. And, act on what you read! Native people have been objecting to mascots for decades. And yet, many remain. Clearly, there isn't enough of a critical mass to effect change in those mascots. 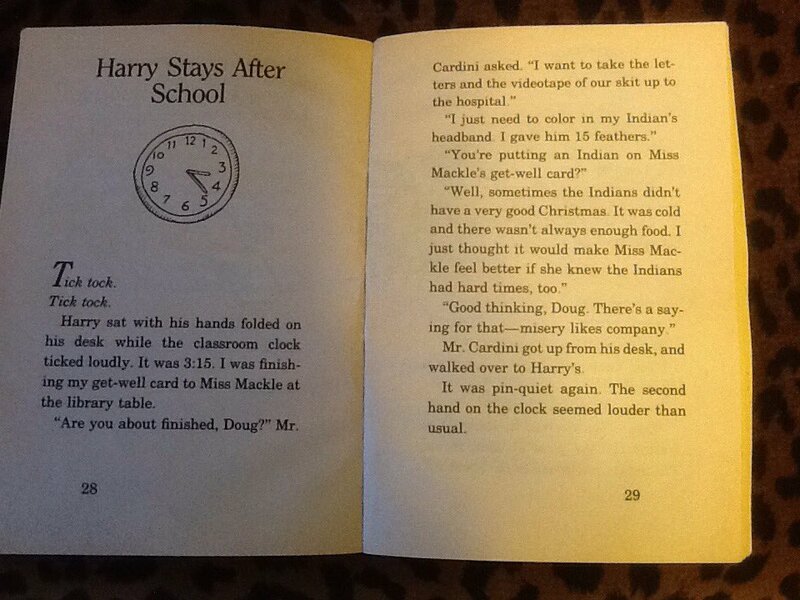 Today (October 23, 2016), via Twitter, I received a photo of a page from Horrible Harry and the Christmas Surprise by Suzy Kline, published in 1991 by Viking. "I just need to color in my Indian's headband. I gave him 15 feathers." "You're putting an Indian on Miss Mackle's get well card?" "Well, sometimes the Indians didn't have a very good Christmas. It was cold and there wasn't always enough food. I just thought it would make Miss Mackle feel better if she knew the Indians had hard times, too." "Good thinking, Doug. There's a saying for that--misery likes company." I gather that Viking is part of Penguin Puffin. Horrible Harry and the Christmas Surprise was apparently part of Scholastic's offerings, too. There's a lesson plan for using it at the Scholastic website. Not a word there, of course, about the problems in that passage. Horrible Harry is a series... I wonder what I'd find in the other 24? !